I started the fried egg while working full-time in the tech industry in Chicago. The newsletter was, at first, a welcome distraction from my job. It was a refuge, in some sense, from the real world. In all the time I spent in the office, I had let go of a lot of my deep ties and interests in golf. The fried egg started primarily as a way to concisely cover golf for working professionals. It turned into more than a side-project. I jumped off the cliff to do this full time in 2016 and 2017 was my first year as a full-time, official member of "golf media." I am stunned at the growth. It is now obvious to me that there is a deep demand for a style and type of golf content that is not available elsewhere. Of course, this site would not be possible without you, the loyal readers/listeners. In retrospect, the site also suffered a bit from a scattershot strategy in its infancy. The path of this site changed unexpectedly in May of 2016. One of my wife's friends was getting married in Knoxville, TN, I didn't know anyone at the wedding and my wife gave me a free pass to play golf one morning. A few weeks earlier, a buddy of mine had told me about Sweetens Cove. He had stumbled upon its Instagram account and sent it to me. The photos were mesmerizing. I had never heard of Sweetens Cove. I didn’t even know anyone who had played it. This 9-hole public golf course was 140 miles from Knoxville. For reasons I still don’t understand, I decided to make the drive. At the suggestion of Rob Collins, I set off on the Saturday morning of the wedding. I left Knoxville, TN at 5 am (after being out too late) to be the first player off and play nine holes. Playing Sweetens Cove was, in some sense, an emotional experience. When I finished the round, it was 8:30 on a beautiful Saturday morning, I had played arguably the best 9-hole course in America. It was an inspirational golf course - and it was empty. On my drive back to Knoxville, I couldn't stop thinking about what had just happened. I played one of the best golf courses in the world for less than $30 on a Saturday morning, and no one was there. How could this be? How could the golfing public be so short-sighted? Why doesn’t the world know about this place? And why aren’t there a lot more Sweetens Coves? The lux clubhouse at Sweetens Cove. One of my goals has been to maintain an uncompromised voice that told it like it is, not how someone wants to hear it. It's no secret that as a member of the media, free handouts are abundant. They come in the form of free clubs, accommodations, rounds of golf, etc. It's why you will rarely hear something bad about a new club or fancy resort course. It’s also why you rarely hear about architectural masterpieces in South Pittsburg, TN with just enough money to keep the lights on. America - in my judgment - needed to be re-educated about golf. The signs are evident from the state of golf’s emerging media. Much of what has been built in media and the golf industry was shoddy and expensive. On that drive back from Sweetens Cove, I determined that the fried egg had a mission. Playable, fun golf course design and architecture became a part of the website's ethos. 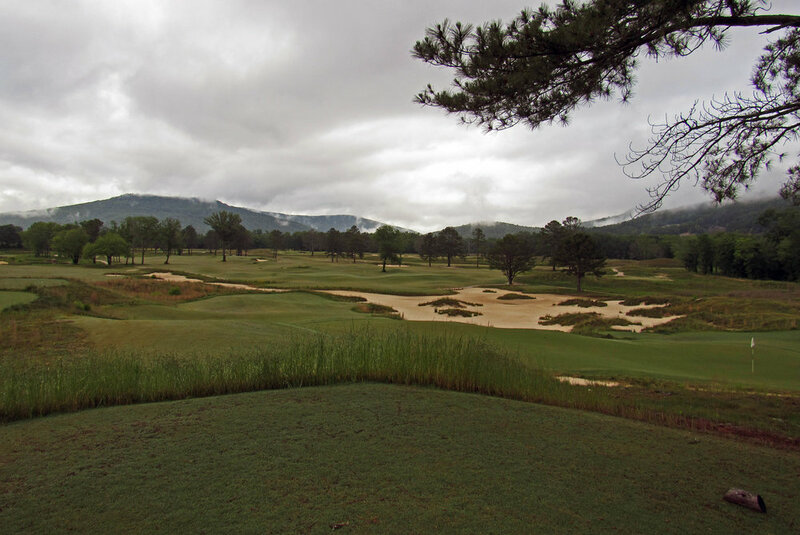 The Sweetens Cove article was the first time I had ever written anything in-depth about a golf course. This remains one of my favorite things on the site. The article was well received enough to motivate me to write more about architecture. Width and angles, a love story. Erin Hills was a convergence of modern architecture and the world's greatest players. This might be the best article I have ever written. In January of 2017, shortly after Golf Digest released their latest Top 100-course list - I wrote a counterpoint article about their ranking criterias flaws. Tiger Woods/South Shore Project - Last December, I caught wind of Tiger Woods involvement in a potential golf course project in downtown Chicago. The Chicago Tribune’s Teddy Greenstein broke the story, but I quickly followed up with a story that showed the world what the course could look like. Needless to say, it was a very cold walk and photo shoot in Mid-December. It was the first article that the fried egg was cited by mainstream outlets. In May, after playing a free round of golf at the NCAA Media Day at highly ranked Rich Harvest Farms, I wrote about what I dislike about the golf course. Fishers Island Club - my best golf course review. Golf Course Architecture 101 - Since going from always interested reader of GCA to someone with a problem I can say it has helped me play better golf and enjoy my time on the course more than ever in my life. This is where you should start and gives you all the resources to become a junkie. On the skillet: Manakiki - In 2017, I might have gotten too into the weeds with public/municipal golf. There are glaring issues with how they are managed, maintained and approached by local governments. The thing that kills me is when a great design is buried by ineptitude. Cleveland's Manakiki golf course is a prime example. Poor mowing lines, horrendous cart path placement and shrunk greens plague the wonderful design. As a result, public golf continues to be a shell of what it could be. When I started the fried egg I was a horrible writer. The first newsletter went out December 9th, 2015. You may confuse it with the writing of a nine-year-old. Thankfully, my writing has improved (I hope). I’ve had a lot of help over the past year - and my saving grace has been my wife - a talented, Journalism graduate of the University of Missouri. I am quite lucky to have her for a great many reasons - but her contribution to this site has been immense and (in the parlance of the podcast) greatly underrated. Paulie has written weekly fantasy articles for two years for free, and I burned out numerous free editors along the way (my wife, sister, friend). One contributor article in particular that brought a great deal of exposure was Kyle Nathan's story of caddying for Tiger Woods. There are many other thank yous due to my many new friends in this business. The list is far too long to post here. I am continually amazed by the outpouring of support and assistance I’ve received from golf fans all over the country. I am excited for next year which will have more content with better production. Sign up for our Monday, Wednesday and Friday e-newsletter.